Welcome to the third of a six part series of essays focusing on Katherine Kurtz's Deryni novels (you may find the first and second parts here). As I am physically incapable of actually reviewing these novels with any semblance of objectivity because they've imprinted themselves deep into my heart, what I am going to do instead is write about the aspects of each of the "Camber Era" novels which have stuck with me throughout the years and which I find intriguing today. Shall we continue? Nyford had burned for a day and a night, but not before rampaging humans had put to death all the Deryni and Deryni sympathizers who could be found. Deryni owned or piloted ships were burned to the waterline where they lay at the quays, after being robbed of their cargoes. Deryni shops were vandalized and looted, their proprietors usually dying in the process. The persecution and purge of the Deryni race have been a looming specter hanging over the first two volumes of The Legends of Camber of Culdi. I'd like to back up a moment by looking forward. 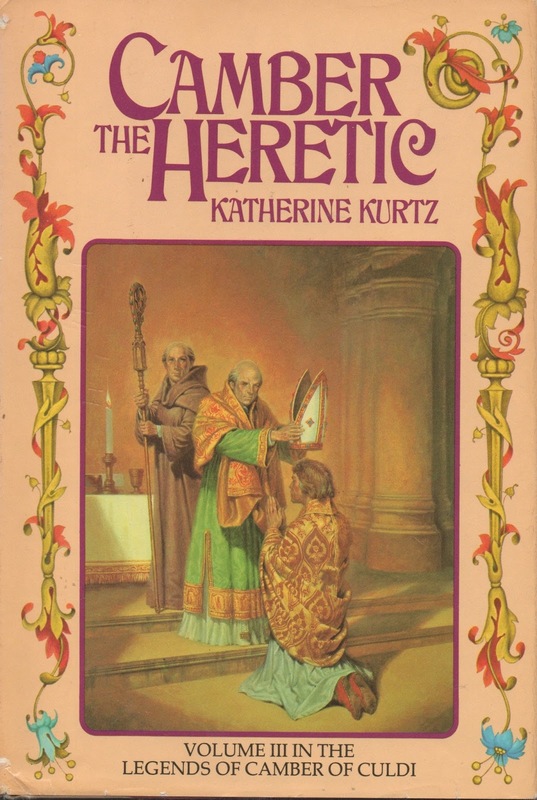 When Katherine Kurtz first published Deryni Rising in 1970, she dropped hints that some two hundred years earlier some really bad stuff happened to the Deryni race, that there was a deryni man named Camber who was canonized and later named a heretic, and in some cases the more "modern" society of Kelson's era was still recovering from what happened "back then." After writing three novels set in the era of King Kelson, Kurtz drew back the curtain and told the stories of what happened in the time of Camber of Culdi. What happened in Camber's era is brutal and nasty and while there are moments of grace, those moments are increasingly fewer and farther between. Camber the Heretic is a dark book that gets darker as it progresses. The persecutions Camber had feared over the course of the two previous novels are now imminent threats as King Cinhil is close to dying and his sons not yet of age to rule on their own. Unlike Deryni Rising, where Kelson is able to take the throne as a competent adult at the age of 14, young (and sickly) Alroy has several years to go until he hits the age of his majority. The proposed Regency Council is primarily made up of human men who hate the Deryni and we learn very early on that they slipped some documents into a stack signed by Cinhil that will grant them power and control to shape the membership in the council itself (rather than simply abiding by the selections of Cinhil). It is the combination of the public fear and anger facing Deryni since the ousting of the Deryni king Imre coupled with the soon to be regents of Gwynedd hatred of Deryni that is beginning to spill over as Camber the Heretic opens. The novel is set some ten years after the conclusion of Saint Camber. Early in the novel, the Deryni Healer Rhys Thurin discovers a new magical technique: the ability to "turn off" a Deryni's power and thus hide any evidence that person was ever a Deryni. Given the pride that Deryni have in their racial and cultural identity, as well as how their magic enhances how they interact with the world, this is no small thing. But, again, with the looming threat of state sponsored persecution of their race, the Camberian Council (a secret group of leading / powerful Deryni) decides to explore the idea of using this new technique as a way to possibly protect their people and relocate them as "humans" until such a time might come that their powers could be returned to them. The plan to block the powers and identity of Deryni is a last resort, because while the Council understands the hope to restore the powers taken away, they also recognize that this is unlikely to happen. Generations of Deryni will be lost, even as their lives may be spared. The Deryni teachers and leaders may not be around, either because their powers are also blocked or because they have also been murdered by the humans. If you've read the original three Deryni novels Kurtz published (Deryni Rising, Deryni Checkmate, High Deryni), you may remember a scene where Morgan and Duncan visit the ruins of Saint Neot's and search for a transfer portal they might be able to use. While they found an unusable portal, they also found an old warning tied to that spot. In Camber the Heretic, we see Dom Emrys, the Abbot of the Gabrillite order of Deryni teachers and healers, leave that message as his brethern are slaughtered, the chapel defiled, the abbey burnt and torn down, and finally, with his last breath he was able to destroy the portal and leave that message before he himself was murdered by human soldiers. It gets worse, though. The part of Camber the Heretic which has most strongly imprinted itself is the wreckage of Trurill, a castle on Camber's former property. It's bad. Coming on the heels of the destruction of the Gabrillite and Michaeline chapterhouses, the discovery of what happened at Trurill is brutal. In some cases, I wonder if George R. R. Martin had read his Katherine Kurtz before setting down to write A Song of Ice and Fire. That Kurtz is describing what happened by showing us the aftermath, rather than writing the events as it happened, is no comfort. Kurtz describes the detail, how the bodies were ripped apart, how the bodies lay, what sort of disfigurement, dismemberment, and torture was done. Who was impaled on stakes and crucified. It is relentless and it is as bleak as anything I have ever read. There is a small moment of grace in this with Evaine directing the powers of her young son Tieg in healing Camlin, but that grace is tempered by the brutal loss of so much and it is then followed by the death of Camber himself (for real this time). Oh, and just in case everything else wasn't bleak enough, late in the novel after the human regents have made a mess of everything that could be considered good and holy and install the truly vile Hubert MacInnis as the new Primate of Gwynedd (sort of like a Pope), the new bishops meet for the Council of Ramos. What happens there? Oh, only the suspension of all Deryni priests and the subsequent defrocking of those priests, the forbidding of Deryni from ever taking Holy Orders again, the repudiation of Camber's canonization 12 years prior, the forbidding of Camber name to even be spoken on pain of whipping or the physical removal of one's tongue, the stripping of all titles of nobility for Deryni, the destruction of the mostly human religious order of The Servants of Saint Camber which included the burning to death of more than 60 mostly human followers, and more. So, nothing much. **In my mind Evaine is a major character. She looms large in my memory of the Camber era novels. So, imagine my surprise when I finish this trilogy and realized that her role was relatively small if borderline non-existent. I think she must have had a much larger role in The Harrowing of Gwynedd and I translated that to this series, but she's a brilliant researcher and was discovering so much about lost Deryni heritage and magic that I really built her up. I was disappointed by her lack of presence. Even when she was on the page, she was so frequently in a minor support role and then quickly pushed aside. **But about that lost Deryni magic - Camber the Heretic features the first mention of "an ancient Deryni brotherhood known as the Airsid". I want to know more!! I want to know more about these faiths, about the lost history, about how little people in the "present" actually seem to know about the past and what that says about what happened in the intervening centuries. **I can't quite remember how the next trilogy goes, but we may have seen the last of the Michaeline Order. As a result of the persecutions, the Michaelines withdrew again, but this time for good. The text mentions Djellarda, the original motherhouse of the other, which overlooks "The Anvil of the Lord." Sometime in the intervening centuries, I believe the Michaelines rebranded themselves as The Knights of the Anvil. We hear of them in Kelson's time, but overall know very little. **It is notable that early on in this novel Camber and company set up the potential for "Haldane Powers" in Cinhil's children - and those powers begin to quickly manifest themselves in Javan, the boy who seemed to have the strongest will to eventually defy the regents. Finally, I will leave you with this, which is very much not a moment of grace but seems fitting based on the pain of this novel.